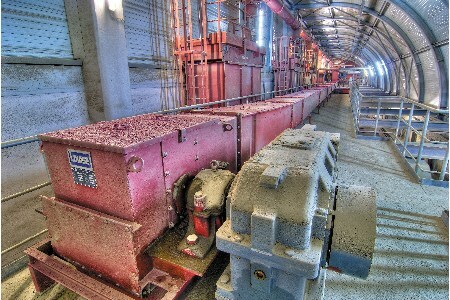 AUMUND Fördertechnik, a supplier of conveying and storage equipment, received an order for three drag chain conveyors with capacities from 7.5 tph to 200 tph for the discharge of limestone, gypsum and pozzolan, and one LOUISE-type drag chain conveyor for clinker dust. The equipment will be provided to Almalyk Mining and Processing's new cement plant in Sherabad, Uzbekistan. The 250 t of provided equipment will also include 10 belt chain bucket elevators, 19 silo discharge plates, and three pan conveyors. A large pan conveyor, with a centre distance of 148 m and a conveying capacity of 300 tph for clinker, constituted the bulk of the order. Uzbekistan has mayor plans to increase its production of cement by 8.9 million tpy by 2020. The new plant in Sherabad is a major part of this expansion. From 2019, the new plant's intention is to run at a capacity of 1.5 million t of portland cement.